Overview of 2011: To date, 2011 has continued to offer many milestones in the area of enforcement. The UAE Courts and regulatory bodies have shown a unique willingness to cooperate with interested parties to reach best practice in the field of enforcement and particularly in the banking sector. To date, 2011 has continued to offer many milestones in the area of enforcement. The UAE Courts and regulatory bodies have shown a unique willingness to cooperate with interested parties to reach best practice in the field of enforcement and particularly in the banking sector. By all accounts, the heightened success in enforcement reflected during 2011 will continue creating a safer and more transparent investment jurisdiction. The UAE is a developing jurisdiction. As such the enforcement of rights and obligations arising from legal relationships under the Commercial and Civil Codes is continuously being tested in the Courts. One must also remember that the UAE is a civil law jurisdiction. In addition to there being no concept of binding legal precedent, many of the principles applying to security in the UAE are different to those in common law jurisdictions. Therefore security such as floating charges or hypothecations, all monies guarantees and assignments of unidentified or future rights are not recognized in the UAE. As a general principle, UAE law and procedure does not recognize the concept of ‘self help’ remedies and the general rule is that security can only be enforced by way of a relevant Court order. Typically enforcement in the UAE involves the secured party filing a claim for the entire amount outstanding and then requesting the Court to both acknowledge the security and confirm the secured party’s preferred position. One of the most common types of security utilized in the UAE is the mortgage over immovable property (i.e. land). once the (30) days grace period is lapsed, the mortgagee may submit an application/petition directly to the execution department of the Dubai Courts seeking enforcement of the mortgage. In accordance with the Dubai Mortgage Law, upon the failure of the mortgagor’s to pay the overdue amount, the execution judge may order an attachment against the mortgaged property so that it can be sold by public auction. At present mortgage enforcement proceedings (to obtain approval to sell the property) usually last between 4 to 6 months if no defenses are raised by the mortgagor. If the mortgagee’s application/petition is valid, the execution judge will issue an order to sell the mortgaged property through public auction. Public auction is organized by and conducted in the Dubai Lands Department and can take a further 3 to 6 months. Once the mortgaged property is sold through the public auction, all proceeds of the sale will be transferred by Dubai Lands Department to the execution department of Dubai Courts. The execution department of Dubai Courts will disburse the funds against the liabilities of the mortgagor in accordance with priority. To date, more than 100 cases have been filed by Al Tamimi for various lenders, with over 30 successful judgments issued, one of which resulted in the first sale by public auction in Dubai (under the Dubai Mortgage Law) earlier this year. In other Emirates such as Abu Dhabi, no specific mortgage laws have been introduced. The main difference is that application for enforcement will go through the Court of First Instance as opposed to, in Dubai, being lodged directly at the execution department of the Court. In most other respects the process is very similar, albeit we have not seen, as yet, the same level of cases in Abu Dhabi. 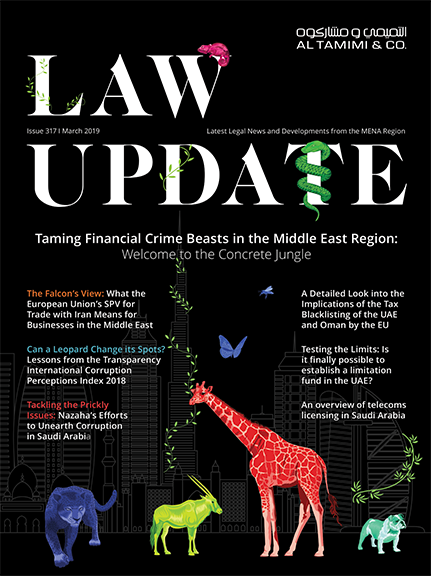 The UAE is governed by a civil law system, which means that all relevant underlying commercial and banking laws are, to a large extent, codified. There is no separate legislation within the UAE which codifies Shari’a law for commercial transactions. However, it can be said that large portions of the UAE civil and commercial laws are underpinned by Shari’a elements and are therefore compatible with Shari’a principles. One common misconception in relation to enforcement is the application of ‘Shari’a law’, or the jurisdiction of Shari’a Courts. Should a dispute arise in the UAE, the matter would be brought before a UAE Court, and the Court is unlikely to apply a different treatment to the dispute solely on account of the transaction being Shari’a compliant. The dispute will be subject to the same processes and procedures as a conventional financing counterpart. The Courts will also apply the laws of the UAE in determining the case. Notably, if a document purports to be governed by Shari’a law, Courts will likely disregard such choice of law, and will instead apply the applicable UAE laws. Generally speaking, Islamic financing products in the UAE are based on an underlying asset, which in a majority of structures is purchased by a bank and sold/leased to a customer by way of Ijara and/or Murabaha. One of the most commonly used Islamic financial products in the UAE is the Ijara. In terms of Ijara enforcement, the financier may have the right under its documents to terminate the lease and/or exercise its rights under the purchase undertaking (to compel the customer to purchase the property at an amount equal to the outstanding amount), however in practice it is unlikely such remedies could be exercised together since the Courts in Dubai (to date) have viewed the Ijara as a sale meaning it would be difficult to terminate the sale and then to confirm, or ask the Court to confirm, the sale through the purchase undertaking. If the financier’s sole goal is to obtain unencumbered title to and vacant possession of the financed property and the financier does not intend to pursue the customer for any shortfall, termination may be considered by the financier due to its simplicity, in particular during execution. Alternatively, if a judgment for the full amount is required, exercise of the purchase undertaking will be preferred. To date, Al Tamimi has approximately 150 cases before the Dubai Courts for enforcement of Ijara documents, a majority of which are based on exercise of the purchase undertaking. To obtain a successful judgment, one can expect a timeframe of 6 to 8 months, with over 50 successful judgments obtained. for a period of 1 to 3 years. Although there has not been a change in the law in this area, we note that the UAE Courts in practice are no longer imprisoning the issuers of all returned cheques, especially in real estate transactions. Rather, in certain cases, the UAE Courts have issued fines to some offenders. Other very valuable and effective tools of enforcement in the UAE include the use of travel bans and precautionary attachments, which usually allow the lender to obtain an element of leverage over defaulted customers and increase the likelihood of engagement by the customer in negotiations with the lenders. Travel bans continue to be granted by the UAE Courts and can be obtained within a matter of days. Precautionary attachments over assets such as property, shares, bank accounts and so on also remain a integral part of most enforcement proceedings, and are invaluable in exerting pressure on the customer and ensuring assets are not disposed of during legal proceedings. Although both are at the Court’s discretion, obtaining a successful order is likely where there is a clear default in payment. Although painful for some, the continued litigation of finance matters and enforcement proceedings in the UAE has, and is, creating more understanding and certainty for industry participants.